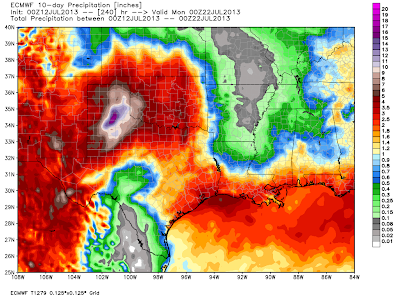 Cooler & Wetter Weather Next Week? NAM 500 MB Analysis At Midnight MDT Last Night. 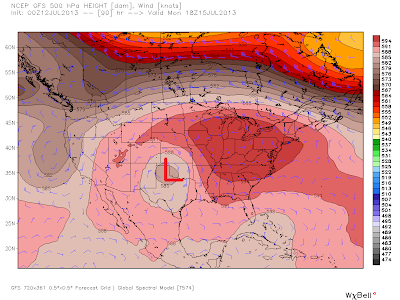 GFS 500 MB Forecast At Noon MDT Monday. Another change in our local weather will be occurring next week. 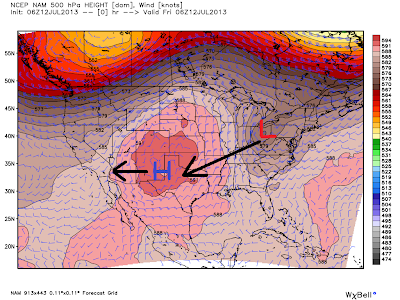 A big ol fat 500 millibar upper-level ridge of high pressure has been parked over the area recently. This has effectively shut down the rain machine for the most part here in southeastern New Mexico. 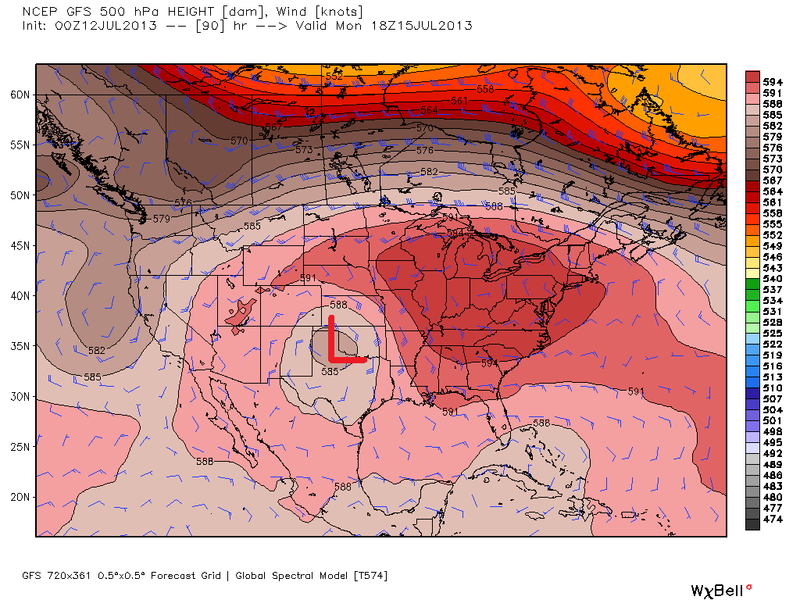 Forecast models are indicating that this ridge will slide westward as a upper-level low currently located over the Great Lakes area moves southwestward. By Monday this upper-level low is forecast to be located near the Texas Panhandle. 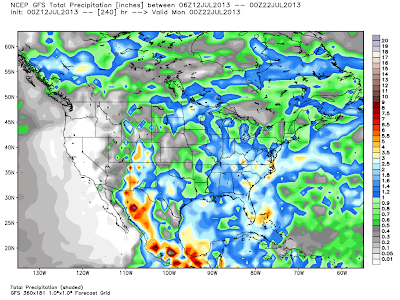 Much cooler and wetter weather will return to the area by the first of next week. Our afternoon high temperatures will continue to range from the upper 90's to near 100 today into Sunday. Monday's highs are looking like they may only be in the upper 70's to low 80's. GFS 10-Day Total Rainfall Forecast. 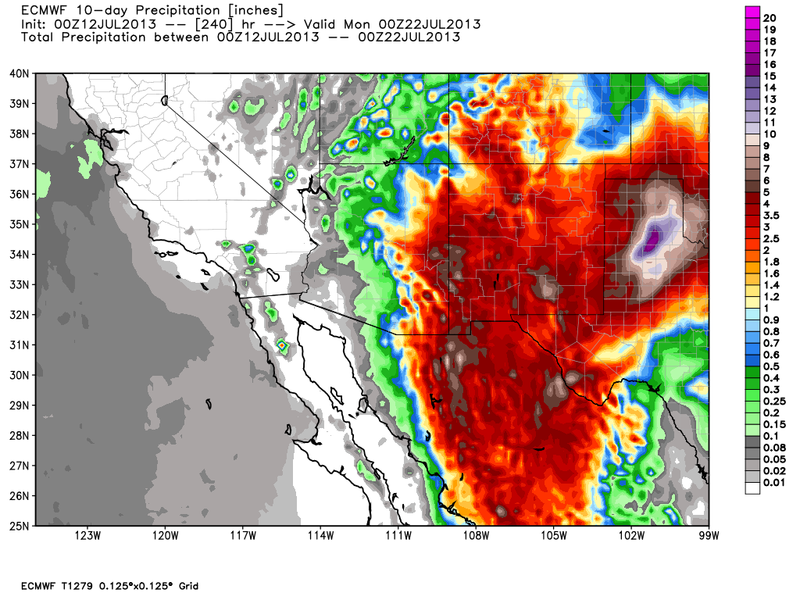 ECMWF 10-Day Total Rainfall Forecast. Can you say wet? How about really really wet? If the European model forecast (two graphic maps above) is to be believed somebody will be swimming. Its total 10-Day Rainfall Forecast for the Childress, Texas area is close to 15 inches of rain! How about 5" - 8" across the Sacramento mountains near Cloudcroft! 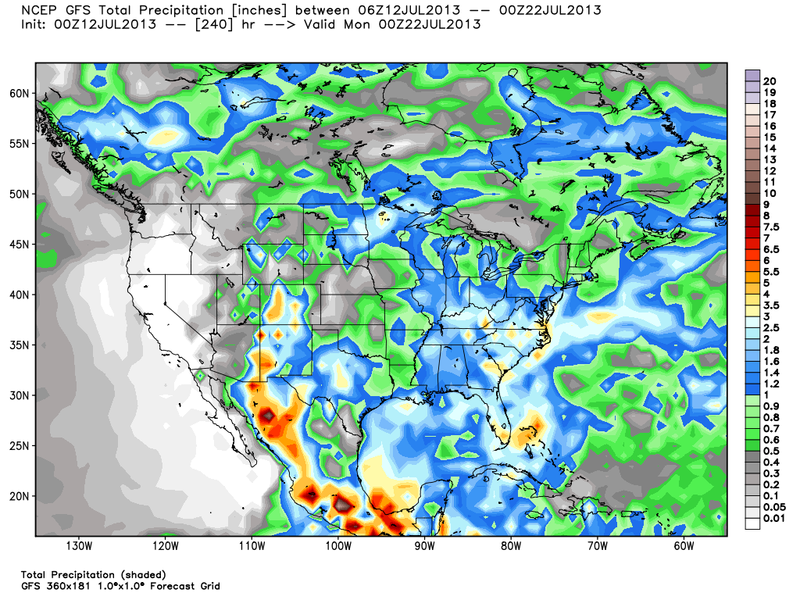 Just who gets the most rain will in part be dependent upon the exact track and location of the upper-level low. I'm not totally convinced that this much rain will fall but its something that needs to be watched.